Let’s talk about the wild blueberry, my new fruit obsession. Since finishing Anthony William’s amazing book, Medical Medium Life-Changing Foods: Save Yourself and the Ones You Love with the Hidden Healing Powers of Fruits & Vegetables , I’m all in with this powerhouse little fruit, consuming at least one serving of it daily. Who is Anthony William? He’s this awesome medium dude who has the power to detect what illness(es) a person has and how he/she can cure it. He’s like other mediums in that he receives information and guidance from Spirit, specifically around health and wellness. In the book, he highlights 50 of what he calls the Holy Four foods, the foods that have the ability to heal the body from various illnesses and symptoms: Fruits, Vegetables, Herbs and Spices, and Wild Foods. Wild blueberries are considered by William to be the ultimate wellness food. This is because they are loaded with antioxidants and also have learned to grow in some incredibly harsh conditions, so they are incredibly resilient. According to William, they pass that resiliency on to our bodies when we eat them. He says that frozen wild blueberries are even more nutrient-packed than fresh conventional blueberries, because the wild blueberries have learned how to hold on to their nutrients in cold conditions – which is great, because even if you aren’t in an area where you can buy fresh wild blueberries, you should be able to find them in the freezer aisle of your local grocery store, as I did. I realize that the concept of a medical medium may sound incredibly out there and woo-woo to some of you and that you’re not buying the idea of a fo0d-psychic guy. I totally get it. Metaphysical-bent aside (which I admittedly love because inside I have the heart of a hippie), the book is still a fascinating read if you’re someone who is curious about the benefits of consuming a plant-centric diet – which I’m guessing you are because you are reading this blog. If you get your hands on a copy of Medical Medium Life-Changing Foods: Save Yourself and the Ones You Love with the Hidden Healing Powers of Fruits & Vegetables , please feel free to post in the comments field below and let me know what you think of it. I hope you find it as inspiring and beneficial a read as I have! 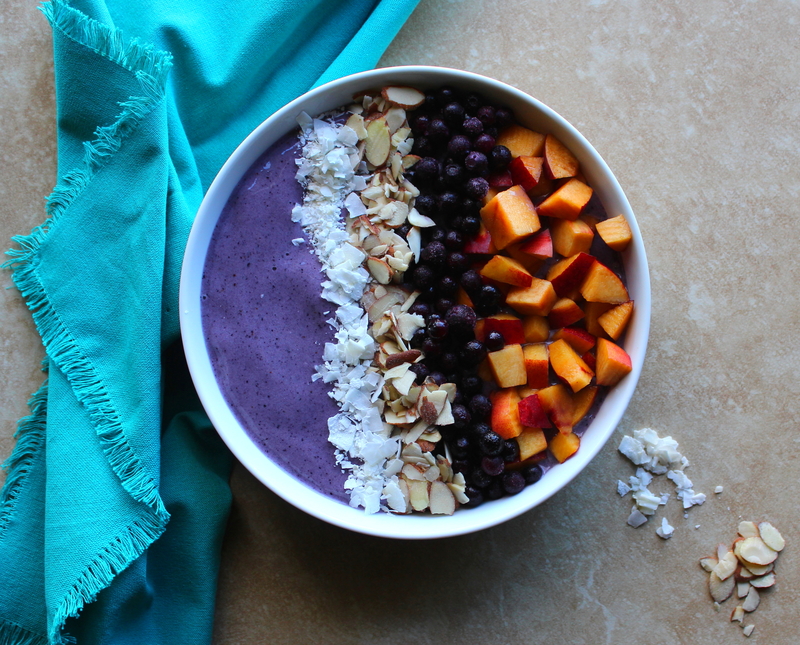 Back to the primary reason we’re here: the Banana, Wild Blueberry, and Nectarine Smoothie Bowl! I know you’re gonna love it because not only is it loaded with the super-food wild blueberries and other amazingly beneficial, nutrient-packed ingredients, it’s also wholly processed-sugar-free, gluten-free, and vegan – so YAY! –Freeze the bananas at least a day ahead of time. I’m pretty fanatical about banana-based smoothies and smoothie bowls, so I try to have frozen bananas on hand at all time (I’m that crazy lady at the grocery store buying several bunches at once and trying to stuff them into one flimsy bag). I like to freeze ripe bananas in sets of two, since I nearly always use two bananas in each of my smoothies/smoothie bowls. I peel them, break them in half so they’ll be easier for my blender to break up, and wrap them in aluminum foil. I’ve found that it’s best to freeze bananas a good 24 hours before using them – that’ll give you the best frosty-like consistency. –Freeze the bowl you’ll put the smoothie into, too. This makes the smoothie have that ice-cream-like thickness longer. –Buy whole flaxseeds and grind them yourself using a coffee/spice grinder. I have the Krups F203 Electric Spice and Coffee Grinder, which I love because it’s so easy to use; here’s a link to it on Amazon . You may see ground flaxseeds in stores, but it’s said that ground flaxseeds can quickly grow rancid, so I like to grind them right before using them. For best storage, keep flaxseeds in your fridge. 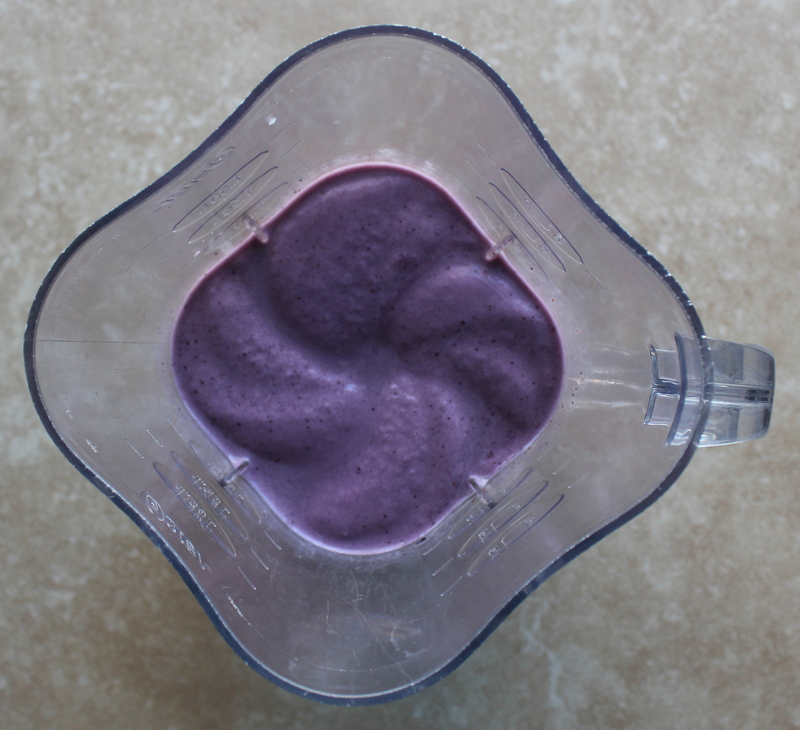 –Have all of your toppings prepped and ready to go before blending your smoothie ingredients. I’ve found it’s helpful to have everything ready to throw on top of my smoothie before blending it. This helps keep it nice and freeze-y for longer – integral when you’re looking to do a photo shoot and get that vibrant, luscious smoothie-bowl goodness up on Insta! Alright, on to the recipe and glorious smoothie-making shenanigans! Add the bananas, the half cup of the wild blueberries, almond milk, ground flaxseeds, and honey to a blender and process until well-blended (you may need to stop the blender from time to time to push the frozen banana pieces down toward the blender blade if the machine is having trouble breaking them up). 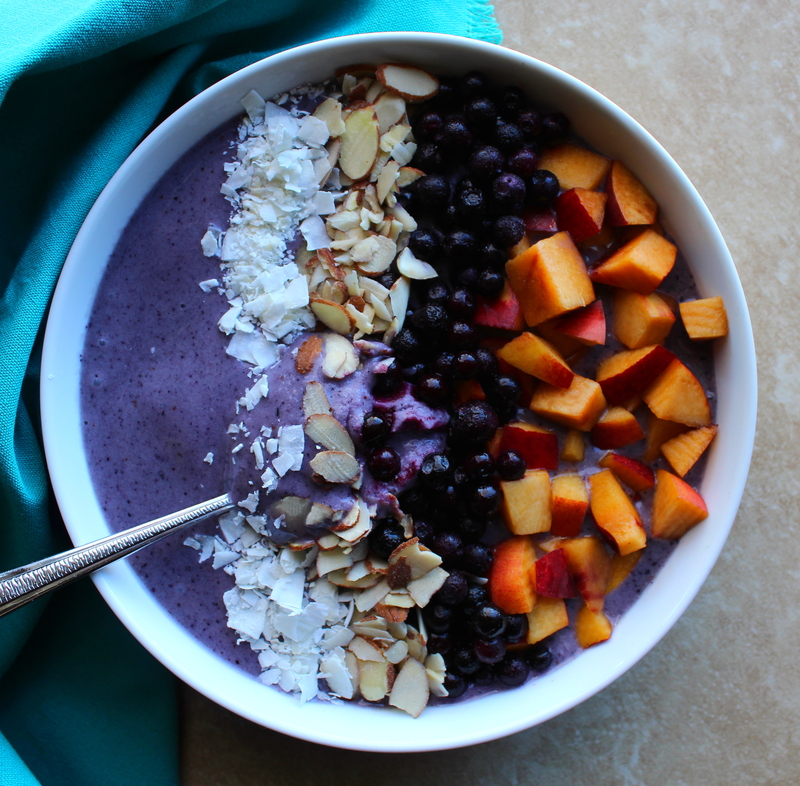 Pour the smoothie into your frosted bowl and top with the remaining one-third cup of wild blueberries, nectarine, almonds, and shredded coconut in any design you'd like. And you're done! You have a beautiful, filling, healthful smoothie bowl to savor before powering through your day!